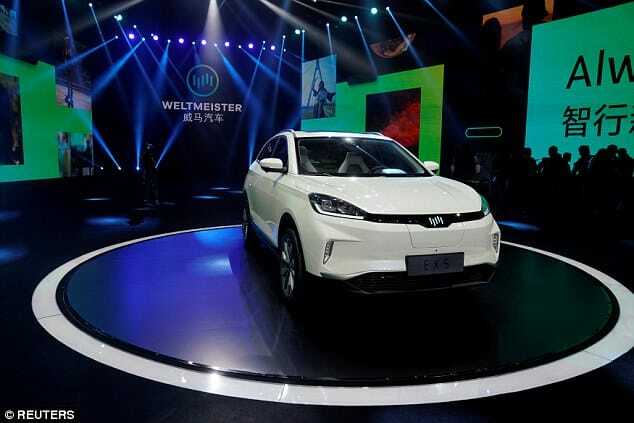 BEIJING - WM Motor Technology Co, one of a new breed of Chinese electric car companies, will use its company name “Weltmeister” as its brand and plans to start taking orders for its first product, a sport-utility vehicle, from April. 2018. The Shanghai-based startup plans to start producing its first car at a new plant in Wenzhou during the second quarter of next year, Freeman Shen, WM Motor’s founder and chief executive, told Reuters ahead of a media event. The exterior design for the SUV was presented at the event in Shanghai on Monday. WM Motor also unveiled a logo for the brand that will adorn its cars. The exterior design for the SUV was presented at the event in Shanghai on Monday. WM Motor also unveiled a logo for the brand that will adorn its cars. The brand name “Weltmeister” is German for “world champion” and reflects the rising challenge to traditional carmakers from startup companies. WM Motor is one of several largely Chinese-funded EV startups betting on the benefits of local production to compete with companies such as Tesla Inc, which has to import cars from the United States and pay a 25 percent import duty. Tesla’s “mass market” Model 3 sedan starts around $35,000 in the United States. Tesla has discussed the need to set up local production in China but has yet to announce any plans. WM Motor plans to start delivering its first car, due to be priced below 300,000 yuan ($45,340), to buyers in the second half of 2018. WM Motor aims to sell 100,000 cars a year with three models within 3-4 years of the planned 2018 launch, Shen said. WM Motor plans to introduce the three electric vehicles by 2020, Shen said. To match that ambition, the assembly plant in Wenzhou has a potential annual capacity of 100,000 vehicles. Other Chinese EV startups include Future Mobility Corp Ltd with its Byton brand, Singulato Motors, and Nio. Nio has said it plans to start delivering its first “volume car,” an all-electric sport-utility vehicle called the Nio ES8, to buyers by June next year. Future Mobility has said it plans to start delivering its first car, also an SUV, during the fourth quarter of next year. Singulato plans to start delivering its all-electric SUV, dubbed the Singulato iS6, to buyers before the end of 2018.